"Slight twist to an old favorite. 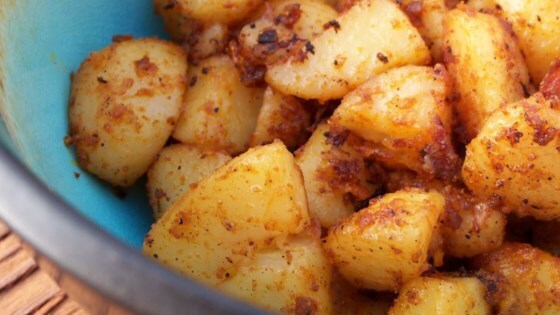 Chili powder gives the potatoes and onions in this recipe some zing! I make these for breakfast every Sunday, and my family loves them!" Arrange the potatoes and onions in a greased 9x13 inch baking dish so that they are evenly distributed. Season with garlic powder, salt and chili powder. Drizzle with olive oil. Stir to coat potatoes and onions with oil and spices. Bake for 35 to 40 minutes in the preheated oven, until potatoes are fork tender and slightly crispy. Stir every 10 minutes. When done, sprinkle with cheese. Wait about 5 minutes for the cheese to melt before serving. They were easy and pretty good. The only change I made was to use a fresh garlic clove. These turned out very well, I used taco seasoning as some suggested and nuked the potatos for 8 minutes before roasting...I'll definitely make these again. Very good and easy! I added chunks of boneless chicken and quartered onions to make it a one meal dish. Served with salad. Guests loved. I had preboiled red potatoes on hand from another project. I spread them out on the sheet tray and pushed them down with my palms to give them the "burst" look. Lovely crisp and flavor...EASY! This was good. A simple, yummy sidedish. You can use any kind of potato really.